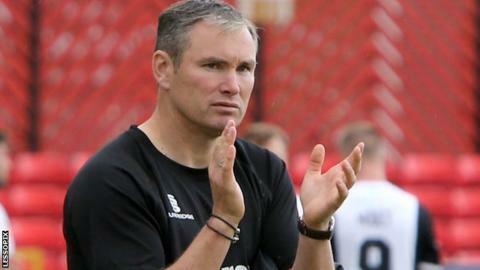 Manager Kevin Wilkin says Wrexham must focus on beating Macclesfield Town rather than the FA Cup first round draw. Connor Jennings' 25-yard strike at Moss Rose earned a fourth qualifying round replay at the Racecourse on Tuesday. The winners of the tie will be at home to Woking but Wilkin is not looking beyond the Macclesfield game. "Let's try and get this job done first and see what awaits us," Wilkin said. "I want to get through Macclesfield first and then worry about it. I don't think we can get ahead of ourselves." Jennings, Wrexham's goalscorer in the 1-1 draw at Macclesfield, misses the replay through suspension as does fellow forward Louis Moult. Moult will serve the final game of a three-match suspension while Jennings is banned for one game after picking up his fifth booking of the season at Macclesfield. "It is a blow but Macclesfield have been without players as well and it's something that happens through the course of the season," Wilkin added. "I don't want to go making excuses for it here and now and making issues about it - it is what it is. "Somebody else will step in and whoever that is comes in and does a good job." Wilkin has no new injury worries ahead of the visit of Macclesfield, who drew 2-2 at the Racecourse in the Conference in August. Read more on FA Cup: What number is your team in the first-round draw?